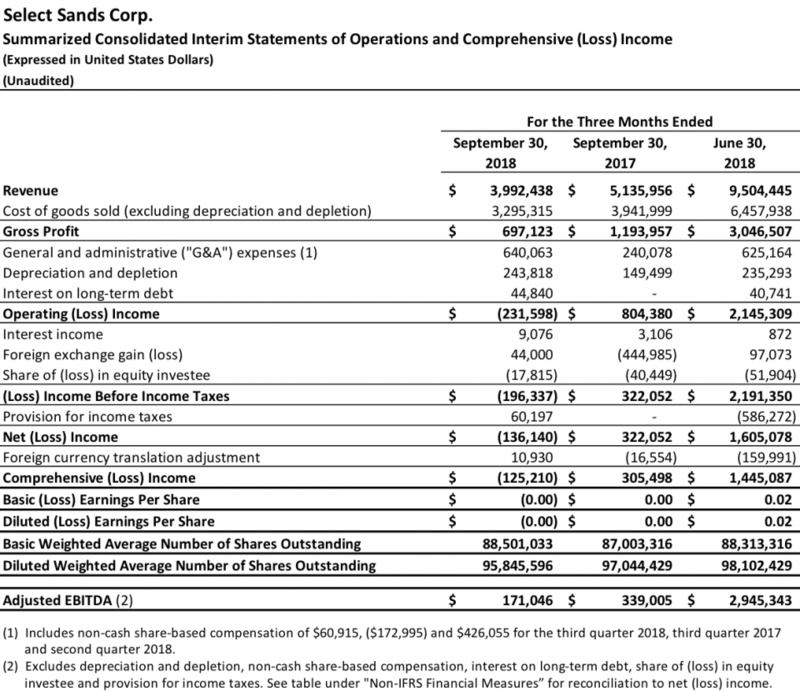 November 14, 2018 – Vancouver, BC, Canada– Select Sands Corp. (“Select Sands” or the “Company”) (TSXV: SNS, OTC: SLSDF) today announced operational and financial results for Q3 2018 and the filing of its financial statements and associated management’s discussion and analysis on www.sedar.com. The Company’s financial statements are presented in U.S. dollars to better reflect Select Sands’ operations and to improve investors’ ability to compare the Company’s financial results with other publicly traded silica sand businesses in the U.S. Prior to reporting its Q4 2017 and full year results, Select Sands’ financial statements were stated in Canadian dollars. The Company will host a conference call on Thursday, November 15, 2018 at 10:00 A.M. Central to discuss its Q3 2018 results (see “Conference Call Information” section in this release for access information). As of September 30, 2018, cash and cash equivalents were $5.3 million, inventory on hand was $2.6 million, accounts receivable was $0.8 million and working capital was $6.4 million. This is compared to cash and cash equivalents of $4.2 million, inventory on hand of $1.8 million, accounts receivable of $4.0 million and working capital of $7.0 million as of June 30, 2018. Adjusted EBITDA is a non-IFRS financial measure and is described and reconciled to net loss in the table under “Non-IFRS Financial Measures”. On October 18, 2018, the Company announced it had placed certain employees at its Arkansas operations on temporary furlough until further notice. Shipments and limited production continue, and Select Sands is pursuing additional opportunities, including evaluating sand production and sand-related business opportunities in or near other basins. The Company’s Independence property expansion project remains on hold, with progress resuming once frac sand demand reaches appropriate levels. Elliott A. Mallard, PG of Kleinfelder is the qualified person as per the NI-43-101 and has reviewed and approved the technical contents of this news release. The Company will host a conference call on Thursday, November 15, 2018 at10:00 a.m. Central (CDT)to discuss Q3 of 2018 results. To access the conference call, callers in North America may dial toll free 1-855-669-9657and callers outside North America may dial 1-412-542-4135. Please call ten minutes ahead of the scheduled start time to ensure a proper connection and ask to be joined into the Select Sands call. Select Sands Corporation is an industrial silica product company, which owns a number of properties in Arkansas and is currently in production at its 100% owned, Tier-1, silica sands property located near Sandtown, Arkansas, U.S.A. Select Sands’ goal is to become a key supplier of premium industrial silica sand and frac sand to North American markets. Select Sands’ Arkansas properties have a significant logistical advantage of being significantly closer to oil and gas markets located in Oklahoma, Texas and Louisiana than sources of similar sands from the Wisconsin area. The Tier-1 reference above is a classification of frac sand developed by PropTester, Inc., an independent laboratory specializing in the research and testing of products utilized in hydraulic fracturing & cement operations, following ISO 13503-2:2006/API RP19C:2008 standards. Select Sands’ Sandtown project has NI 43-101 compliant Indicated Mineral Resources of 42.0MM tons (TetraTech Report; February, 2016) and Bell Farm has Inferred Mineral Resources of 49.6MM tons (Kleinfelder Report; April, 2017). Both deposits are considered Northern White finer-grade sand deposits of 40-70 Mesh and 100 Mesh. This news release includes forward-looking information and statements, which may include, but are not limited to, information and statements regarding or inferring the future business, operations, financial performance, prospects, and other plans, intentions, expectations, estimates, and beliefs of the Company. Information and statements which are not purely historical fact are forward-looking statements. The forward-looking statements in this press release relate to comments that include, but are not limited to improved customer demand for frac sand, returning to full production levels, further capacity expansion and a lower cost profile. Forward-looking information and statements involve and are subject to assumptions and known and unknown risks, uncertainties, and other factors which may cause actual events, results, performance, or achievements of the Company to be materially different from future events, results, performance, and achievements expressed or implied by forward-looking information and statements herein. Although the Company believes that any forward-looking information and statements herein are reasonable, in light of the use of assumptions and the significant risks and uncertainties inherent in such information and statements, there can be no assurance that any such forward-looking information and statements will prove to be accurate, and accordingly readers are advised to rely on their own evaluation of such risks and uncertainties and should not place undue reliance upon such forward-looking information and statements. Any forward-looking information and statements herein are made as of the date hereof, and except as required by applicable laws, the Company assumes no obligation and disclaims any intention to update or revise any forward-looking information and statements herein or to update the reasons that actual events or results could or do differ from those projected in any forward-looking information and statements herein, whether as a result of new information, future events or results, or otherwise, except as required by applicable laws.